Now if there’s one place Joshua really wanted to show me in Edinburgh – it was Pickles! When Josh came to have his tartan made six months ago, he and his dad visited this little place 3-4 times in one weekend! Me and Josh managed to get a visit in while we were there too – but it was so busy we had to sit outside and wait for some space to free up! We didn’t mind though as they had a heater outside and if a place is that busy – its a really good sign! This tiny little place is nestled under the french restaurant L’escargot Bleu which I posted about a few days ago. Pickles is super-cosy with wooden tables and chairs, comfy sofas – and, as it was Christmas, twinkly lights which is always a win in my book! The staff were really friendly and even remembered Josh from his visit previously! Now I’d heard lots of good things about the meat and cheese platter from Pickles and was told I HAD to go and try it. It was definitely worth the wait outside because when it came we were not disappointed. The main platter came with four chunks of cheese all from Scotland. The first was a smooth brie which wasn’t too strong. The second and third were stronger and more like a mature and extra mature cheddar and the third had much more of nuttier flavour – unfortunately because it was so busy I didn’t get a chance to ask what they were – so I could be totally off guessing a cheddar, it could be far more fancy! The forth type of cheese was a blue cheese. Me and Josh are not big blue cheese fans – I enjoy it in a sauce but that’s about as far as I’ll go. I did try it but it was very in your face as you would expect from a blue cheese. I’m sure any blue cheese fans out there would love it! The meat section of the board was brilliant, it can two types of chorizo is thin slices, a selection of parma ham and prosciutto as well as some thin slices of Italian salami. The board came with a selection of pickles including gerkins, pickled onions and olives and was served alongside a long tray of freshly sliced french baguette and proper butter. Even the tray that carried our cutlery to us brought us two jars of chutney, one a farmhouse chutney and one a rhubarb version. This was heaven on a board! 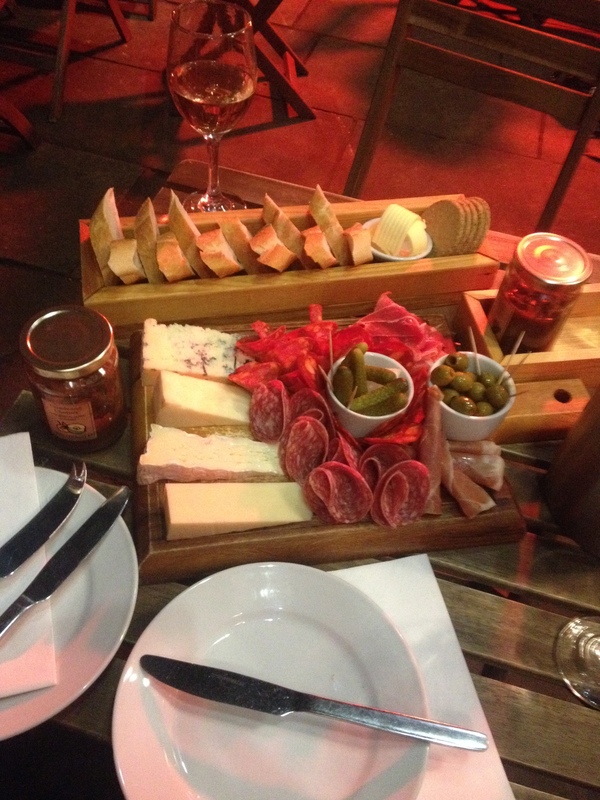 I have never seen a meat/cheese board as good as this one. I was very very impressed (and very very full) and I can see why so many people recommended it! This cosy little place tucked down off the street was a real joy to visit and was so worth the wait to get it – I’m sure we will be heading back to Edinburgh some time in the future because we had such a good time and I am sure we will look this place up again.